Mayfair Gardens, located off Dunearn Road, is the latest development to be acquired via a collective sale – by Oxley Holdings for S$311 million. 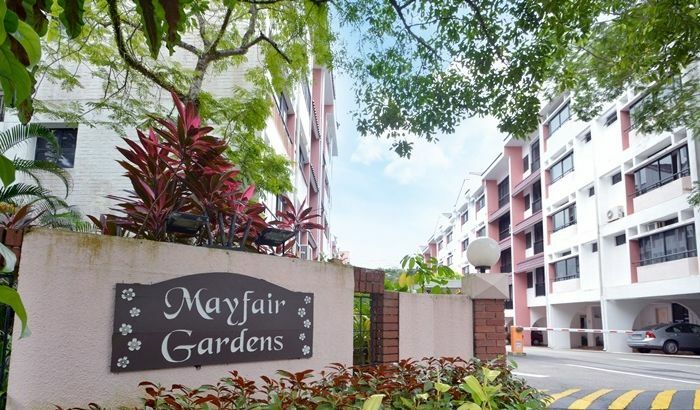 The reserve price for the Mayfair Gardens en bloc was previously set at S$265 million and based on the transacted price, each owner is expected to gain sales proceed between the range of S$1.7 million – S$2.89 million from this collective sale. The 124-unit Mayfair Gardens comprises a total of 6 residential blocks (all walk-up) with apartments ranging between 100 to 200 square metres in size and has a total size area of 19,368 square metres. The development is located within close proximity to various top-notch educational institutes such as Hwa Chong Institution and Methodist Girls’ School, and also just 300 metres away from the new King Albert Park MRT Station (situated along the Downtown MRT Line). With an additional premium of estimated S$52 million for topping up the lease to a fresh 99-year tenure, the land price of Mayfair Gardens will translate to approximately S$1,244 psf ppr. According to marketing agency Knight Frank, the site has the potential to yield around 387 new private homes with a median size of 70 sqm for each unit and the breakeven price for the new launch project in future would be around S$1,780 psf. The URA Master Plan 2014 has indicated that the site has a 1.4 plot ratio, which will give it a maximum gross floor area (GFA) of 291,865 square feet. It was noted in the reports that Knight Frank has brokered the en bloc sale of 5 developments in the last 6 months, which include the Normanton Park en bloc and Dunearn Court en bloc – a total transaction value of S$1.8 billion.